The AccuAir VU4 Air Valve Unit is engineered to provide the cleanest installation and most reliable operation on the market. This electronic solenoid valve unit inflates and deflates up to four (4) individual Air Springs and has built-in push-to-connect 3/8” D.O.T. approved air fittings for all of its plumbing connections. The robust internal solenoid valve architecture maximizes flow rates, provides bubble-tight sealing, and guarantees operation up to 200 psi for millions of cycles. 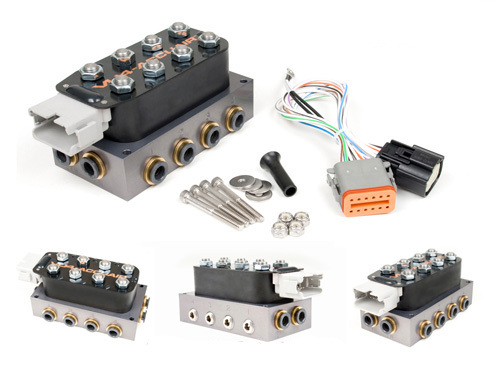 All of this technology is housed in a unique enclosure design which routes each of the solenoid wires to a single weatherproof connector, eliminating typically loose wires. This not only improves the appearance, but it also guarantees proper operation for every installation. With an overall size of only 5"x 3"x 3" and the ability to survive harsh under vehicle environments, this product is ideal for any application. • For use with e-Level™ Controller or any other brand of controller or switches. • 3/8" Press-Fit D.O.T. fittings eliminate pipe threads for 100% leak free operation. • (4) 1/4” NPT Pressure Ports (remove plugs). • High Pressure Rated for operation up to 200 psi. • Dual Inlet & Exhaust ports for maximum flow. • Compact Layout for minimal space usage (5”x 3”x 3”). • 100% Weather Resistant for harsh under vehicle environments. Return to our AccuAir Products page for more great items like the AccuAir VU4 Air Valve!